BMW Xplore is a strategic mobility service that builds on 8 touch-points that have been identified after studying peoples behaviours, dreams and problems on long-distance driving in the user research. The project aims to remove pain-points in mobility through a human-centred and iterative design process that included immersive prototyping from the beginning. 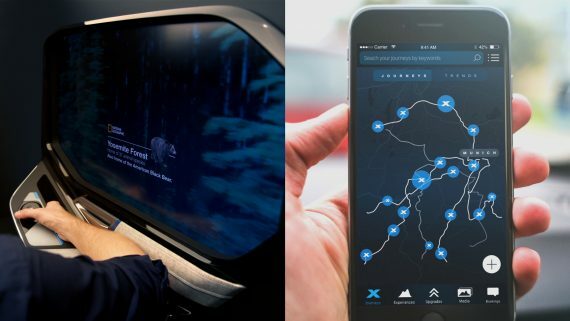 BMW Xplore offers curated mobility experiences that built on the vehicle as the platform. It gives users an overview of locally available experiences that include required tickets, equipment and offers users to personalise their experience for example by ordering needed items to deliver them into the vehicle beforehand. This aims to make planning and arranging less time consuming and seamless. All involved people can personalise their experience on the digital platform but also modify the journey and propose things to see along the way. When people arrive they get welcomed by a fully prepared vehicle. The entertainment-system democratised the digital aspect within the vehicle and gives everyone access to music, the route and enables people to discover aspects of their surrounding and destination. In addition, it enables and triggers interaction between people in the vehicle by giving an overview about when the journey becomes interesting and when highlights will appear. It gives all passengers in the vehicle tools, which were usually restricted to the driver, to create a more social and collaborative experience. During the user research, people often told that typically when a passenger made a discovery outside during the drive people react and look out of the window but often times they are already past the spot. Therefore BMW Xplore explores the idea of travelling in time and empowers people to control their environment. This approach leads to “The Window of the Future” which is based on a TOLED (Transparent-OLED) which enables people to turn from a transparent window to a virtual experience whenever they want. By using the “TimeDrive-Controller” the users can stop the moment and are able to go back in time to take a closer look at what they just passed. This works by using the cameras that face outside and enables autonomous driving capabilities of the vehicle. It even allows you to experience slow motion, take a photo/video without pulling out your smartphone or travel into the future by using camera content from other vehicles. Another insight from the user research was people often complain that they forget things they discovered. This can range from a restaurant to an impressive architectural building. The window enables people to bookmark what they discover by pushing the “TimeDrive” button which gets synchronised with the app and can be shared. Furthermore, the window acts as an AR platform on which other developers can design experiences. Ultimately providing a platform for immersive storytelling and connecting people closer to their context. The project shows that automotive experiences of the future have ultimately to be equally designed in the same level of experience-quality for the passengers as for the driver today.